1. Rolling resistance: this is the resistance of the ground surface that impairs the forward movement of the wheels. Under "normal" road conditions (dry road, good pavement, road bike), rolling resistance is negligible compared to aerodynamics, but all you have to do to see how big of a deal it can be is ride along your local paved bike path at 18-20 mph, hop off the pavement onto the dirt and try to maintain the same speed. Though road races with dirt or gravel sections are becoming increasingly popular, rolling resistance is always a significant factor in Mountain Bike and Cyclocross races. 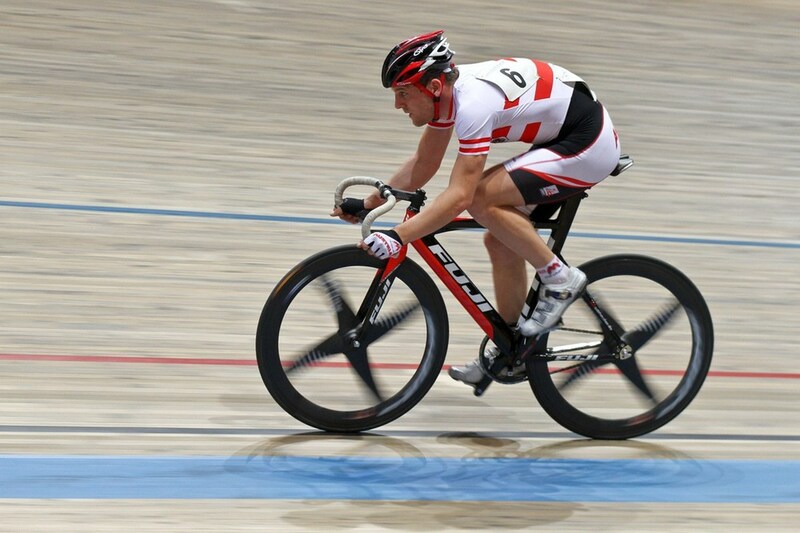 For more on tire rolling resistance, check out this article from Lennard Zinn (VeloNews). Determined by: riding surface (e.g. smooth asphalt, concrete, wooden track, rough asphalt, dirt, rocks, sand, mud, etc. ), tire width, inflation pressure, speed, rubber compound, tread pattern, TPI (threads per inch). 2. Traction: Traction and rolling resistance are essentially 2 sides of the same coin. Traction refers to the "grip" a tire has on the road; it's what keeps our tires from sliding on the road and thereby, our bodies from sliding on the ground. Higher traction does not necessarily mean higher rolling resistance though. In fact, to a certain extent it's the opposite. The less traction, the more slippage. Slippage causes friction, thereby greatly increasing rolling resistance. 3. Weight: nowhere on the bike is weight more important that on the tires and wheels. Even when riding on a flat (or downhill) road, mass that lies on the outside of a rotating surface is constantly being accelerated. This is one area where even a few grams of weight savings can be quite significant. On the other hand, it doesn't matter how light your tires are if you are constantly getting flat tires. Determined by: rubber compound, tire thickness, tire width. 4. Wheel compatibility: Most people are aware that tubular wheels take tubular tires and clincher wheels take clincher tires. However, when you throw tubeless wheels and tires into the mix it makes things a little more complicated. Most clincher rims can now be converted for use with tubeless tires and most tubeless rims can be used with a clincher tire and tube. Tubeless tires are now ubiquitous in MTB racing and increasingly popular for road and cyclocross racing but they may not be ideal for training since tubeless tires require high pressure to seat properly and most of us don't carry high pressure pumps when training. 5. Flat resistance: Flat tires were the most common mechanical problem 100 years ago and they are the most common mechanical problem today. To some extent flat tires are unavoidable unless we want to use solid rubber tires. Roads have broken glass and potholes. Once we venture off the road we have to contend with rocks, thorns and 100 other potentially flat-inducing obstacles. That doesn't mean flat tires are completely unavoidable though. Choosing the right tires helps, but being smart about where on the road/trail you ride, how you carry your weight, checking your tires for wear and cuts regularly and replacing on a timely basis is equally important. 6. Aerodynamics: You might not think that aerodynamics comes into play too much for tires but you'd be wrong. Just as there is nowhere that weight reduction can be more important than with rotating surfaces, the same can be said for aerodynamics. Now, tire manufacturers can only do so much to change the shape of the tire without affecting it's other qualities, but that doesn't mean they can't do anything. The two most notable examples in the past few years have been the Zipp Tangente tires (with dimples) and the Mavic CX01 wheel/tire systems (smoothed interface between tire and wheel). Even with traditional tires though, the width of the tire and gap between tire and frame will affect aerodynamics. For more on tire aerodynamics, check out this article, also from Lennard Zinn. 7. Suspension: Tires are your first and foremost form of suspension on any bike and they are the majority of your suspension on a road, cyclocross or rigid mountain bike. Your tire will do more to either soak up road bumps and "noise" or make you feel every last vibration than anything else. In general, lower tire pressure, softer rubber compounds and higher TPI will give you more suspension, but here is a limit. Just as over-inflated tires will hurt reduce traction and comfort while increasing rolling resistance, under-inflated tires can bring about a higher risk of pinch flats, and also cause higher rolling resistance/less traction. Like many things, the trick is to find the best middle ground. 8. Durability: Obviously we want our tires to last as long as possible, especially when many tires run over $100 a pop. Unfortunately, the easiest way for a manufacturer to get a tire to last longer is to make it thicker and use a harder rubber compound. Most likely this means a heavier tire, higher rolling resistance, less traction and a less comfortable ride. So we must compromise. Most of us are willing to accept a tire that is a bit heavier for training if it lasts a little longer and there's less chance we'll be stuck outside changing a flat tire in 20 degree weather. Similarly, when racing, we're probably willing to accept a little shorter tire lifespan if the tire is lighter, has less rolling resistance and has excellent grip wen cornering. However, that doesn't mean we want to train on solid rubber or we want to be gluing tubulars on our race wheels every week. With everything there are limits. 9. Shedding: This is the ability of a tire to displace water, dirt or mud. In dry conditions on good pavement or a concrete/wood track, it's not a huge concern but as soon as the rain starts to fall or you start riding in the mud it becomes important. The better a tire displaces water or mud, the better your traction and the lower the rotating weight of the tire/wheel. What pressure should I pump my tires to? 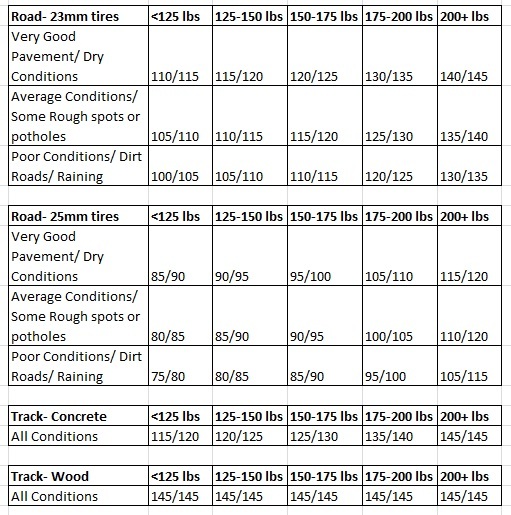 Recommended Tire pressure for different width tires, course conditions and rider weight. The first number is for the front tire, the second is for the rear tire. This chart assumes a 55%/45% weight distribution (rear/front). For mountain bikes, hybrids, cruisers and recumbents, the rear tire split will be higher and for TT/tri bikes the split will be closer to 50/50. Before all you tire pressure nerds start writing in and picking this apart, let me say that I know it is oversimplified and this is on purpose. So instead of trying to make a chart that accounts for every possible scenario, let's keep the chart simple and address some of the possible exceptions. First of all, it's important to read the min and max pressure limits for your tires, rims and rim strips (if applicable). Never go below minimum or above maximum recommended limits, but that doesn't mean pumping to min or max allowable pressure is correct either. Second, the thickness of the tire and the rubber compound will also come into play. The thicker the tire and the harder the rubber, the lower the pressure needs to be. Third, whether you use clinchers, tubulars or tubeless tires makes a difference. Tubular and tubeless tires don't pinch flat, so you can generally get away with lower pressure with either. Tubular rims can also tolerate higher pressure since they don't have sidewalls. Last but not least, riding style and personal preference come into play as well. Riders with more "finesse" and those more careful about avoiding obstacles can get away with lower pressure. Those that prefer the "bulldozer" method might want to go a bit higher. A wooden track is as close to a perfect surface as you will find, This means that you can get close to max allowable pressure because there isn't much need for suspension. Should I buy 25 mm or wider tires for my road bike? Short answer: If they fit, probably. The standard for road cycling seems to be quickly changing from 23mm to 25mm. In general, 25 mm tires are more comfortable, more flat resistant, corner better, have lower rolling resistance and can be pumped to a lower pressure without a high risk of flatting. Downside? They weigh more, are less aerodynamic, won't fit on every bike (e.g. the chain stays on my Canondale Evo aren't wide enough to accept a 25mm rear tire) and the selection on 25mm tires is not as good as with 23mm tires (at least at this time). I would also note that for TT/Triathlon bikes it's probably best to stick to 23mm tires because of the aerodynamic factors as well as typically smaller gaps between the frame and the tires. In my opinion, 27mm tires aren't necessary except in extreme conditions (e.g. Paris Roubaix), though some riders, heavier riders in particular, may prefer them. Is it worth it to buy a tubular race wheelset? Maybe, maybe not. 30 years ago, just about everyone used tubular (sew-up) tires for racing and many used them for training as well. It wasn't even possible to buy a race quality clincher tire. Things are different now and there are plenty of great high quality clincher tires available. Advancements in manufacturing technology have allowed many wheel companies to manufacture high quality carbon clincher rims that won't crack the first time you ride over railroad tracks. Of course, there are still 2 good reasons to consider tubulars: 1. The tubular rim/tire combination is lighter than the clincher rim/tire/tube combination. For example, a set of Zipp 404 firecrest carbon clinchers with Tangente clinchers will weigh about 285 grams more than the tubular equivalent. Hardly insignificant, especially when you're talking about rotational weight. 2. You can get away with using a lower pressure for tubulars without the risk of pinch flatting. This is especially important for cyclocross, where many racers like to run 20-30 psi in their tires. Contrast these with the benefits of clinchers: 1. It's a lot easier to switch to different tires depending on the course conditions and 2. You don't have to glue your tires on, which is messy, smelly and time consuming. At the end of the day, it still comes down to personal preference. How can wider tires and lower pressure result in lower rolling resistance? Was that a typo? No, but I'm glad you're paying attention. It is a bit counter-intuitive that you might actually increase your rolling resistance by pumping it up more or by going to a narrower tire but it is true, within limits. Narrower tires and higher pressures mean that less rubber is in contact with the ground. The bumpier the surface is, the less rubber will be in contact. This means that the rotational force is concentrated onto a smaller piece of rubber, which means more chance of slippage (and hence a higher rolling resistance). Even when the road surface is "pretty good" (e.g. average asphalt road), there are small bumps in the road surface where highly inflated or very narrow tires will slip. These "micro-slips" may not even be individually perceptible, but overall they will slow you down because the friction between the tire and the ground impairs forward movement. So why don't we go to the other extreme and all use huge tires and super low pressure? The answer is that a) wider tires are heavier and less aerodynamic and b) It's not really necessary under most conditions. Basically, once you pass a certain threshold, slippage becomes insignificant. This threshold can be met with fairly narrow tires and high pressure on a "perfect" surface like a wooden track (hence the higher pressure recommendations for track racing), but the bumpier the surface, the wider the tire and the lower the pressure required to prevent excessive slippage (hence the lower pressure recommendations for off-road racing). Are there tires I can use in snow and ice? Yes! For mountain biking in the snow, I am of the opinion that a most mountain bikes do OK for casual snow use, but a fat bike is ideal. That said, it may not be worth it for you to buy yet another bike just for snow riding (note: enthusiasts will be quick to point out that fat bikes can be used in all sorts of conditions). As far as ice, that's a different story. The best way to ride in ice is to put a pair of studded tires on your mountain bike or cross bike (some road bikes may accept them as well, but be careful in order to avoid frame damage). If you need help selecting a pair of studded tires, check out this excellent article from Peter White, who lives in New Hampshire where the winter riding options are a) Get studded tires or b) Ride indoors. Studs work surprisingly well in icy conditions, but use caution using them in good conditions because the studs can easily rip out of the tire. Which tires should I use indoors? As I mentioned in my article "How I learned to stop worrying and love the trainer, part 2", riding indoors wears tires down faster than outdoor riding. In particular, indoor trainers will "square off" your tires, making them dangerous to ride outdoors. A few manufacturers make indoor trainer specific tires, but they are not safe to ride outdoors so I would only recommend them if you either ride exclusively indoors in the winter or you have a separate "trainer wheel". Of course, another option is just to use a tire around that is too worn out to ride outdoors but not quite showing it's threads yet. If you're like me and you ride both indoors and outdoors in the winter but you don't want to get another wheel for the trainer, just keep a close eye on your rear tire and expect to replace it a little more frequently. If you have any other tire questions that I didn't answer, feel free to send em' in!